The main muscle groups involved in volleyball include the chest, shoulders, abs, and legs, specifically the quads and glutes. Each group has a specific purpose as it relates to your game. Your power while playing volleyball is determined by the strength of these muscle groups. Include the following exercises in your routine once or twice a week to begin strengthening them. The muscles of the shoulder, or deltoids, increase stability and strength in the joint. The following exercises support steady and strong passing and setting skills. Start with a set of light weights in hand, five to 15 pounds maximum. 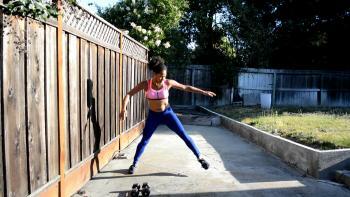 Stand with your feet hip distance apart, dumbbells resting on the front of your thighs. With a slight bend in your elbows, raise your arms to shoulder level. Be sure to engage your abdominals so that you don't press your hips forward or arch your back. 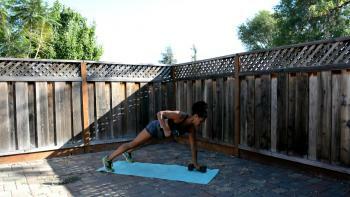 Lower your arms so that your dumbbells touch the sides of your thighs this time. 4. Raise your arms out to the sides until they are at shoulder level. Complete eight to 10 repetitions total for three rounds. This is a challenging exercise, so begin with lighter weights until you master the form. You can always increase your resistance later. Start with a set of medium weights, from 10 to 40 pounds. 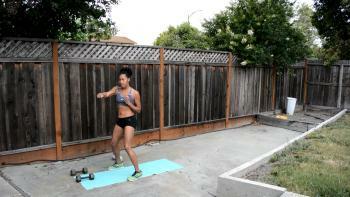 Begin standing with your feet hip distance apart, dumbbells at shoulder level. Extend your arms up above your head until they are straight. Make sure to tighten your abdominals to avoid arching your back as you lift the weight overhead. Complete eight to 10 repetitions, three times through. If you have a hard time with this, use lighter dumbbells. The muscles of the chest, or pectorals, increase the strength and power of your arm movements while playing volleyball. More specifically, working the chest creates more force in your serves and spikes. Pushups are a staple for chest workouts. You will be hard pressed to find a simpler, more effective exercise to build strength in the pecs. There are many variations of the pushups chest exercise, so be sure to find that one that fits your needs and fitness level. The bench press, or chest press, is another classic exercise that you can easily slip into your routine. The key is to complete them with proper form. If you do not have a bench, simply complete them on the floor with dumbbells instead of a bar. Many volleyball players leave abdominal work out of their workout routine. A little known fact is that this muscle group supports nearly every single skill used on the court. The abdominals are crucial for rotation, flexion of the spine, and core stabilization. Exercises in your strength training routine should include moves that enhance all of these benefits. Simple, yet effective, you can complete crunches anywhere without any equipment. Skilled volleyball players tighten their abdominals in a crunching motion as they spike, serve, and pass. Add crunches to your exercises, and you will begin to notice a difference in these moves immediately. The renegade row is a plank alternative that stabilizes the entire abdominal region, especially the obliques, which are involved in twisting or upper body rotation. It works the upper back and shoulder muscles, which help to prevent injury during arms swings like serving and spiking. You will need a light to medium set of dumbbells for this exercise. The range is 10 to 25 pounds. 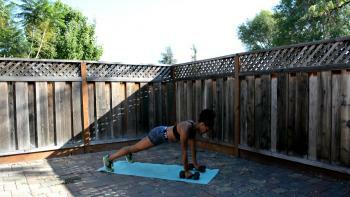 Begin in a high plank position with your hands gripping your dumbbells. Lifting one hand off the floor, drive your elbow back toward the ceiling until you hand is next to your chest. Make sure to squeeze your shoulder blades together on your back and tighten your core muscles to avoid letting your hips shift from side to side. Complete a total of 10 repetitions, three times through. 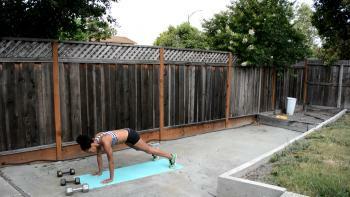 If this exercise is too difficult in high plank, you can modify by lowering your knees to the ground. 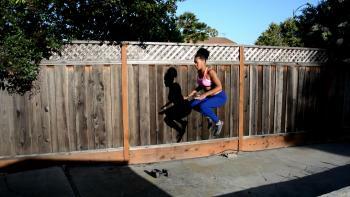 The muscles of your legs, namely the quads and the glutes, are main movers in your vertical leap. Building these muscles allows you to jump higher for spiking and blocking. Other bonuses of working your legs include deeper squats for passing tough serves and stabilizing your body for lateral motion. For that, you need to engage the muscles of your inner thighs and ankles. If you've ever thought of adding squats to your routine, now is the time. Squats work the glutes and quads in combination. They are ideal as because they mimic the actual moves you complete on the court when passing or preparing to hit. Although a squat can be completed using bodyweight only, adding resistance will take your leg strength to the next level. 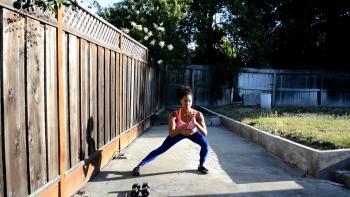 The side lunge is a simple way to work your inner thighs and ankles, along with the glutes and quads. Practicing this exercise is specifically useful in preparation for lateral steps when reaching for a pass or side shuffles needed to get into blocking position. Step your right foot about three to four feet out to the side. This will vary depending on how long your legs are. Keeping your left leg straight, press your hips back behind you and bend your right knee to a 90 degree angle. Complete 10 to 15 repetitions, then repeat on the other side. Complete two rounds. If this exercise seems easy, add resistance by holding a dumbbell or kettlebell. Motion is everything on the volleyball court. You need to be able to get to the ball quickly, without faltering. That means including exercises in your routine that will help you shave milliseconds off your spike, get back into position after a dive, or shift from moving in one direction to another as fast as possible. The following moves are meant to make you move quickly, with dexterity. They work multiple muscle groups, plus they increase your cardiovascular endurance, so you can play longer and harder. Include them in your workout once or twice a week to enhance your game. Start standing with your feet slightly wider than hip distance apart. Firm your abdominals and make fists with your hands, lifting them to shoulder level. Rotate and punch diagonally across your body with one fist, then repeat on the other side. For best results, alternate punches as quickly as possible without rest for 30 to 60 seconds. Start in high plank position with your wrists under your shoulders. 1. Hop your feet forward, just behind your hands or outside of them. 2. Jump up as high as you can, stretching your arms above your head. 3. As you land, begin again by placing your hands on the floor immediately. 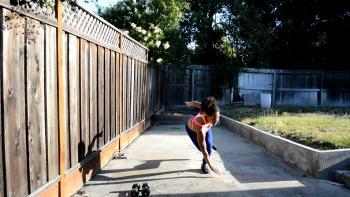 For best results, complete as many burpees as you can in a span of 30 to 60 seconds. Make your burpee more challenging and beneficial to your volleyball game by adding a tuck. As your feet leave the ground and your arms stretch toward the sky, draw your knees up toward your chest until they are parallel to the ground. Pull your arms down as quickly as possible to tap your hands to your thighs. Reach them up again before your feet hit the ground. Stand with your feet hip distance apart, knees slightly bent. Hop laterally, pressing off of one foot. As you land on the other, bend your knee and reach across your body. Quickly hop to the other side. For best results, alternate as quickly as you can for 30 to 60 seconds. For sensitive knees, step instead of hopping. If you're short on time, a workout that combines strength moves for each muscle group is your best option. This high intensity interval training workout was designed to enhance your volleyball game. Follow along with the first round, then repeat on your own two or three times. If you find yourself getting winded during the workout, don't be afraid to hit the pause button. Take longer breaks if necessary to catch your breath and regroup. If you want to improve your volleyball skills, you must work on power, speed, and agility. The best way to do that is to perform exercises that increase the strength of your muscles, amplify your pace, and refine lateral transitions as well as direction changes. Add these types of exercises to your fitness routine to begin seeing the results you want today.